Home to white, sandy beaches, lush rainforests and award-winning accommodations, Sentosa is more than just a tourist spot. Following the increasing popularity of alfresco weddings, the resort island has also been recently regarded as a potential wedding venue. Together with Sentosa Golf Club, we find out the perks of holding your wedding at the resort getaway island! Surrounded by lush foliage and crystal clear waters, hold your destination wedding at Sentosa without having to leave on a jet plane! Not only is the island located away from the hustle and bustle of the city, its unique location also offers stunning views. 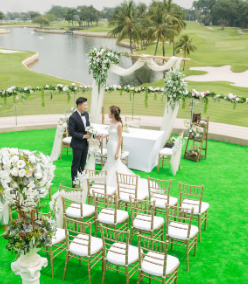 Take Sentosa Golf Club for example: enjoy the picturesque view of the South China Sea when you exchange your vows at the award-winning Serapong and New Tanjong golf courses. Or, have the harbour skyline of Singapore as the idyllic backdrop for your celebration at the Sentosa Pavillion. The Pyramid, a venue within the Club that is set on the highest point of the island, offers a whimsical garden-like setting that is perfect for intimate ceremonies. So not only are couples able to hop on the trend of alfresco weddings, you’ll be able to hold a destination wedding at a fraction of the cost when hosting your celebration on the island. In addition to its relaxing resort vibes, Sentosa also offers a plethora of photography venues that are worthy for the ‘gram. Golden hour by the beach photoshoots aside, the island features lesser-known photoshoot spots, including a cascading waterfall located within Sentosa Golf Club. That’s right, we’re talking about hosting a whimsical wedding held beside a majestic waterfall that is surrounded by lush foliage. Overlooking the world-class award winning Serapong golf course, Sentosa Pavilion is the most coveted location for your dream wedding. The Pavilion has two floors consisting of the banquet hall which is equipped with floor-to-ceiling glass windows that allow the flooding in of natural light that is perfect for photography. At the same time, the rooftop deck is the perfect location to host your solemnisation ceremony at. Located within the clubhouse, the Grand Salon Ballroom is a versatile and stylish space ideal for wedding ceremonies. Equipped with essentials necessary for the celebration, the ballroom acts as a blank canvas that sets the stage to your dream wedding. Now that the wedding is over, it’s time to kickstart the honeymoon! A home away from home, indulge in the relaxing island’s themed-attractions, spa retreats and eateries for the perfect getaway. From having a splashing good time at Adventure Cove Waterpark to taking a stroll by Palawan Beach to indulging in a spa treatment at ESPA, the options are limitless. In working with some of Singapore’s leading hotels such as Amara Sanctuary Resort Singapore and Sofitel Singapore Sentosa Resort & Spa, Singapore Sentosa Golf Club also offers couples accommodation options while catering to their needs. Should you be travelling overseas for your honeymoon, a short staycation to relax and rejuvenate after the wedding is the perfect prelude to your travels! So if you’re looking to plan a local destination wedding or host a charming alfresco reception, a resort-inspired celebration is definitely worth the consideration. In addition to its whimsical settings, Sentosa Golf Club also houses a team of culinary masterchefs who will love nothing more than assist you with crafting the perfect wedding menu. For more enquires, visit www.sentosagolfclub.com or contact Sentosa Golf Club at sgc_sales@sentosa.com.sg and (65) 6373 7135. 2 article(s) are related to this vendor.